Things continue to be difficult for a number of coalfield families this Christmas season and the wonderful ladies of the Friends of Coal Ladies Auxiliary are doing everything they can to help these families have as good a holiday as possible through their “Giving Hearts” Program. Their program provides toys, new clothes and food to the less fortunate in schools, housing projects, churches and deployed military families. Last year, the Ladies were able to provide a bountiful Christmas to 27 families, who were in dire need and were most appreciative. As I’ve said many times, “These ladies are unbelievable. 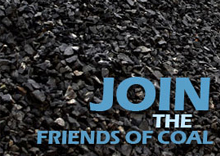 The tremendous job they do to make sure people are provided for…..that’s just representative of our coal industry”. They “NEVER QUIT” working on our industry’s behalf with well-known agencies to identify the families and to verify their needs as well as the needs of those families whose breadwinner is deployed on active military duty and away from home. This, of course, takes money and the Ladies are in desperate need of financial assistance in order to properly carry out their humanitarian representation of our industry for these families. I ask that you please consider a contribution to help the Ladies show everyone that COAL continues to CARE through their worthwhile “Giving Hearts” Program. Of course, any amount would be most appreciated. 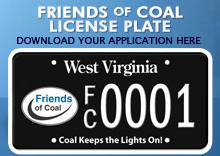 The Friends of Coal Ladies Auxiliary is a 501(c)3 tax-exempt organization to which personal and corporate checks can be written and mailed to P.O. Box 1109, Beckley, WV 25802. 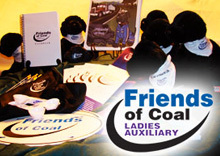 Contributions can also be made by clicking the “DONATE” button on their webpage, www.friendsofcoalladies.com, where more details of their activities are described. Regina Fairchild, Chairwoman of the Ladies Auxiliary asks that you contact her at rf961@suddenlink.net or 304-673-2995 if you have questions or need more information.